Here's Scarf #7 in my series of cable scarves. Notice the theme in my naming scheme? Yeah, I'm not very original when it comes to names. I've been trying to type up this pattern since February. Things on this end are moving like molasses on a cold winters day. Besides my personal issues, not feeling very well and some hand/wrist/arm issues (due to knitting? typing? ), Miss M has also decided to give up on her afternoon naps. This means I have to entertain her instead of getting a little break during the day. Oh well, I knew it would eventually happen, I just wish it didn't happen so soon. I do wish she was better at playing independently when I'm around; she does that fine when DH is watching her (and I am out of the house). She's always been extra clingy around me. The scarf is knit in two halves, each half knit from edge to center and then grafted together at the center using Kitchener Stitch (see here for directions, or here for video), because I had symmetry issues and wanted the pattern to look right-side-up when both ends are hanging in front. I normally hate seaming, but my desire for symmetry won out. I had to bang my head against the wall when I was attaching the 4th ball and finally realized that I was using 100% wool and could have spit spliced 2nd ball. That doesn't mean that I only had 6 ends to weave in. I actually had more because I found 3 knots out of 4 balls. I was not too happy about those odds. And of course, 2 of those knots occurred before I realized I could just spit splice them. This is one of many places that can show you how to spit slice. This was my first time working with this yarn. It is listed as DK weight yarn but feels on the lighter/thinner end to me, almost like sport weight. It's definitely lighter than any of the other DK weight yarns I've worked with. This is really soft yarn, which is expected of "merino" wool. I love it. I just wished I had bought more of it. 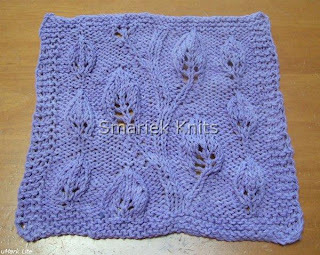 One thing that surprised me was how much it stretched after blocking. 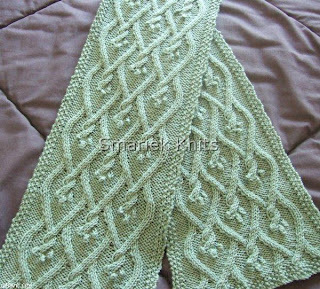 My scarf was 69 inches x 7 inches before blocking, I thought that was a good length when I stopped knitting it. 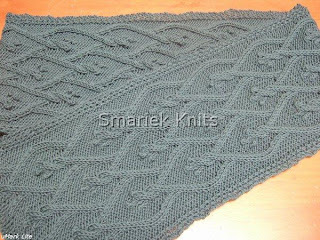 I knew it might stretch a bit during blocking, but never imagined that it would stretch to 83 inches x 9 inches!!! It is way longer than I intended it to be. Must remember in the future that this yarn stretches like crazy. Oh, I have to share this photo of the scarf blocking because it shows the quilting pins I picked up to use as blocking pins. See those little round yellow pin heads? Those are my new blocking pins. Melanie suggested wrapping some pins in a damp paper towel to test for rustproofness. They did pass the damp paper towel test. Yay! The rusty T-pins I used to use are getting tossed out. When it rains, it pours. The storm was brewing since Good Friday, with some drizzle and light rain. Then the brunt of it happened on Easter Day, and boy was it a WHAMMO of a storm. I think there was a slight misunderstanding when my doctor told me to carry an umbrella around in my purse. I think I was supposed to interpret that to mean holding the umbrella open over my head at all times (and maybe even wearing gore-tex parka, pants, plus waterproof hat, gloves & boots!). 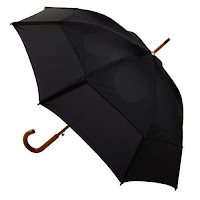 Not one of those mini/compact wimpy umbrellas you pick up at the chain drug store in an emergency, but a strong durable one that won't flip over in the wind. One with strong ribs, maybe 16 ribs instead of the usual 8 ribs. I was so glad to be home when the brunt of the storm hit that evening. It definitely would have been awkward if I were out and about, even if it were near home (at the supermarket, library, etc). I now understand why my doctor said, "you wouldn't want to be at work when it happens." It was a long and sleepless night for me. I had the cramps from hell, however I was pleased at managing with 500 mg of acetaminophen (Tylenol) instead of resorting to the Vicodin my doctor prescribed for me (although I do have to wonder whether the Vicodin might have helped me sleep better). The storm finally did subside by morning, and I'm hoping that this is it. I can deal with some light rain, but I'm not sure about the next big wave if there is one. I didn't think of it at the time but probably should have asked my doctor whether this was going to be a multi-wave storm and how long it would last. I'm feeling a little sad, but am moving from denial to acceptance which is a good thing, I think. I do have some knitting to share with you as soon as I get around to feeling my old self. I'm too tired right now. I know I have some knitting to share, but my mind is drawing a blank right now as to what it was. I also have a new pattern to share with you, it is part of my series of cable scarves. I've been meaning to type this up since February! I promise to get it posted before the next Ice Age. 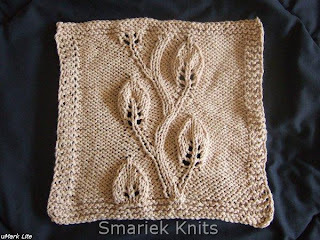 This is a follow up to the Embossed Twining Vine Leaf Cloth, where I attempted to fill in the negative space on either side of the center panel. So I perused my BWs and stumbled upon the Embossed Leaf Pattern in BW1 which looked like it would be a nice match with the Embossed Twining Vine Leaf Pattern. I had to tweak the Embossed Leaf Pattern a bit since I didn't want a staggered allover leaf pattern. I changed it to a single panel of embossed leaves and placed them around the center panel. I must knit funny because I couldn't get the center panel to come out well when I knit it using the directions in my stitch dictionary. I had to tweak it a bit to get it to look neater; you can read about my tweaks here. 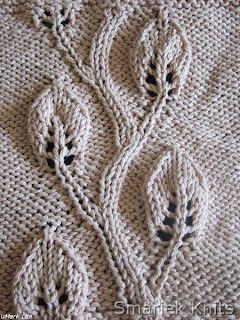 I was happy to find that the leaf pattern I chose to go around the center panel did not require any tweaking, it looked fine to me knit from the instructions as-is. 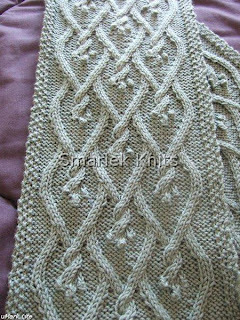 I think the center panel stands out better without the leaves on either side, however I can also see how some people might find all that reverse stockinette stitch on either side to be rather blah looking. M1F (Make One Front) = From the front, lift the running thread between the stitch just worked and the next stitch with the left needle, then knit into the back loop of this stitch. First I want to thank everyone for your kind words, thoughts, and prayers, in email & comments to my last blog post. I appreciate it, and it is in some ways reassuring to know that others have also gone through this before, and that a successful pregnancy can follow. Mini update. I just discovered that my appt next week on Friday with Dr H had to be rescheduled because she'll be at the hospital (on call? surgery? I forget what it was), and so my appt is the following Friday in April. Dr H only works part time, 2 to 3 days out of the week, so it is difficult to get an appt or get rescheduled. I haven't been online much lately, I've just been in my own little world. I've started to learn Mandarin (Chinese) because it is the language my in-laws speak. I'm sure Miss M has picked up on some Mandarin during her visits. I'm also teaching her a few words here and there. It's cute when she says things in Mandarin, even if she mispronounces them. It is definitely not so cute when I mispronounce words. Mrs. Byrne's Dictionary of Unusual, Obscure, and Preposterous Words by Josefa Heifetz Byrne. My copy is from 1974, back when many paperback books were small (and this one only cost $3.50 back then). I'm not sure why books have gotten wider, taller, and thicker over the decades. My book is definitely showing some wear. The spine has split apart, and the middle section/pages of the book has completely separated from the book. I have to be careful not to lose any of the pages. She updated the book some number of years back and renamed it The Word Lover's Dictionary. I can't seem to find either at the bookstore, so they are not easy to find. I would like to get a new copy. Peter Bowler has a series of word books, the first is The Superior Person's Book of Words. There are two follow up books to this one. I have never seen any of them at the bookstore though. One book you will find at a bookstore today is Barbara Ann Kipfer's Word Nerd. It's worth a perusal the next time you're camped out at the bookstore. Flipping through books like these is easy and fun. It's definitely easier than dragging out the Shorter Oxford English Dictionary. Mine seems to gather more dust sitting on the shelf. We celebrated Miss M's birthday. At 3 yrs, she definitely gets the birthday concept, particularly the presents and cake. I haven't sorted through all the photos yet, I'm waiting to get the photos from my inlaws' camera so I can amalgamate them with ours and then go through them together. Miss M colored Easter Eggs for the very first time today. Ok, it's been decades since I last did this, but those Paas coloring kits seem a whole lot fancier than I remember them to be. They come in so many flavors now! I chose a simple one for Miss M, the Zoo-Fun flavor, just 6 colors and stickers for her to decorate with. That should be plenty for a 3 yr old. I had forgotten what it was like. It wasn't as fun as I imagined it to be. There was too much waiting involved. Drop the color tablet in a bit of water and wait for it to dissolve. This takes a while, and it must seem much longer to an impatient 3 yr old. Then you add more water, and drop an egg in. Now what? You wait. And wait. We distracted Miss M by having her open one of her presents, her first Playdoh. She had lots of fun with that. Then we came back to the eggs. You take them out and wait for them to dry. Sigh, more waiting. Finally, after lunch, we get to decorate them with the stickers. The photo above shows the first 6 she did. Yes, the green one is cracked on top, she dropped it. Oops. 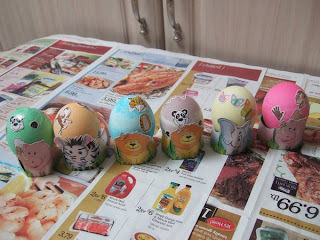 A few more eggs are bathing in some colored water, so she'll have some more to decorate later. AT THE SAME TIME, when piece measures 10" from beg, shape armhole and neck as foll: Next row (RS) Keeping pat as est, bind off 7 sts, work to last 3 sts, k2tog, k 1 (neck edge). After 3½" of Third Block pat has been completed, rep First Block and Second Block pats each for 3½", dec 1 st at armhole edge every other row 7 times; AT THE SAME TIME, cont to dec 1 st, 1 st from neck edge every 4th row 11 more times -- 21 sts. 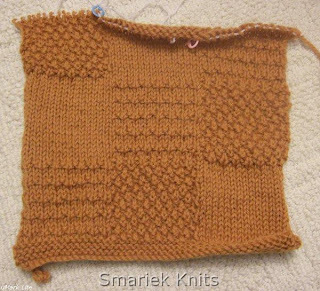 When 3½" of last Second Block has been completed, bind off all sts. 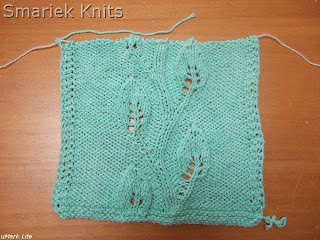 Since I knew (1) exactly where I stopped before starting the armhole shaping, (2) that I needed to work 20 rows for each Block (to get the 3.5" I need), and (3) that I need to work up to 20 rows of Block 2 before bind off, I decided to jot down the Block # / Row # I need to knit going forward from this point until bind off row, noting decreases where they need to be done. I did this for the Back Section too, cuz I apparently can't follow the block pattern AND remember where to do the decreases otherwise. then Bind Off noxt row. I would only work the neck edge decrease 10 more times instead of the specified 11 more times. 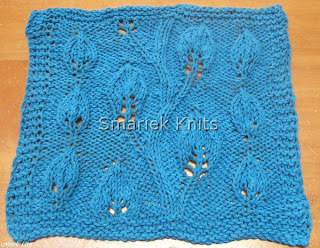 I haven't yet decided whether to go ahead and knit it this way, leaving 22 sts on the needle before binding off (instead of the specified 21 sts). 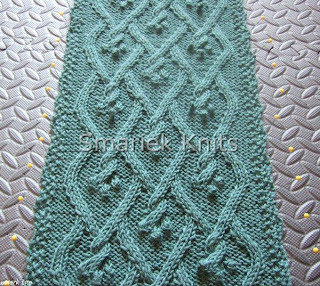 Or whether I should work the K2Tog decrease in the bind off row ... is that even kosher? This is just an update on what's been happening with me, which may be TMI or of no interest to anyone who is looking for knitting content. If this is the case, then skip this post, scroll further down and read the next one. I went to the lab last Thurs and Sat for my quantitative HCG blood tests. The Thurs one went fine. On Sat, I made the mistake of looking at what was being done, saw this BIG vial, and got lightheaded. Look away. Look away. Never look at what they're doing. Why did I look this time? I got a phone call this morning from Dr. H's office asking me to come in. So I rounded up the traveling circus and we headed over to the medical building. According to all the dates, I am at 10 weeks. Dr. H told me that my HCG levels were ~55,000, which is normal for this time. She removed a polyp and said that this was most likely the cause of my bleeding. Did a Pap. So far so good. But then we went to the Ultrasound... the machine registered 8.5 weeks and no heartbeat. No heartbeat! Dr. H said that it stopped growing about 1.5 weeks ago, and at this stage it is due to chromosomal defect. I can't tell you how I felt when I heard this news. We wanted another baby and it took us such a long time to actually conceive, so this felt like a major blow. Another concern I have is that I am in my late 30's so it's not getting any easier (and the risks are increasing). Dr. H gave me the option of letting the natural miscarriage take its course, which should happen within 2 weeks, or choosing a D&C with or without general anesthesia. She said that the natural course would be painful, more painful than when Aunt Flo visits, but that it shouldn't be too bad for someone who has gone through natural childbirth without epidural. But then, she also said the same thing about D&C without general anesthesia, and also mentioned that many teens go through D&C at PP without any. I decided to let nature run its course and see if it'll flush everything out on its own. I have a follow up appt with Dr. H to see whether the natural process was complete, and if not, then she would do a D&C to remove anything left over. She also prescribed some Vicodin for any miscarriage pain I'll feel. I'm hoping it won't be so bad that I will need to use them. Since we don't know exactly when this will happen, she advised staying close to home. One more thing, and it is a stupid thing. Dr. H asked me what my blood type was. I know I've been told what it is many times. I just can't remember what it is. So she ordered a blood test to find out. So yes, I got poked 3 times within 5 days. What fun. I was so proud of myself for managing to hold back the tears until I got into the car (after stopping by the lab for the blood test after seeing Dr. H). I'm trying to take it easy now. I was trying to think of how to break the news to my Mom, when she called while I was giving Miss M her lunch. The first thing she said was that I shouldn't have done any heavy lifting, should have done this, shouldn't have done that, said I probably drank too much green tea, etc. She has her own ideas about why things happen or don't happen. She's superstitious and went on to tell me about things that happened during the first 15 days of the Chinese New Year. It's challenging to make her understand something medical/scientific in simple terms that she would understand, especially when I am unable to explain it in Chinese. This morning I got a call from someone at Dr. H2's office asking whether I was going to pick up the paperwork before going to the lab, and also when I was going to do the blood test. I mentioned that I would be at the medical building on Thurs (this is to remove stitches from my biopsy last month) so it would be convenient to do the blood test on that day. Then she told me that I would have to follow up with another blood test on Sat; she clarified that there would be 2 blood tests. I hadn't picked up on that little detail when I spoke to Dr. H2 last night. What I didn't understand was why I couldn't take the blood test today (Tues) and then follow up with another on Thurs (since the Thurs/Sat combination was also 2 days apart). She told me that if I did the blood test today (Tues), then I would have to do the followup blood test on Friday. Whatever. It'll just be easier to do it on Thurs/Sat. Dr. C called me last week to give me the results on the biopsy. Good news, it wasn't cancerous. It's so nice to get some good news. However she told me that the pathologist also mentioned that the mole looked "moderately atypical" and recommended somethingorother, forget the exact terminology but the gist of it is that they want to cut around the mole site a little more just to be safe. I'm not yet sure I want to do this on Thurs when I get the stitches removed. The area seems to be healing nicely, however the skin around that area has gotten a bit sensitive due to the adhesive on the bandages that I've been changing every day. The inlaws took Miss M last Saturday for a sleepover, so DH & I got some couple time together. :-) We thought we'd see a movie -- a current movie playing in the movie theater -- something we hadn't done since The Illusionist. But nothing really jumped out at us as a must-see, so we didn't go. We did manage to have dinner out, just the two of us, without Miss M. That's another thing we hadn't done in ages. It felt so weird not to have Miss M around. Well, that's pretty much what's been going on in my world lately. I haven't made much progress on Mom's vest. I am so sick of looking at the color of that yarn. And my eyes tend to get tired whenever I work on it. Gosh, it really would be so much easier to buy her a vest. ... 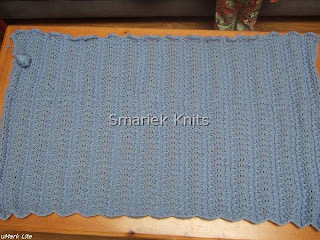 I have finally finished the Baby Blanket I started in December 2005. Many babies have been born since I started the project. What has this project taught me? I have learned that I can never finish big projects by deadline. Just don't try it. Don't even start. However I can start another big blanket for a yet-to-be-announced baby who will be born three or more years from now. If I start that now, then it'll be done in time for such a baby. I've seen other people whip up baby blankets in no time. I have to wonder how they do it. 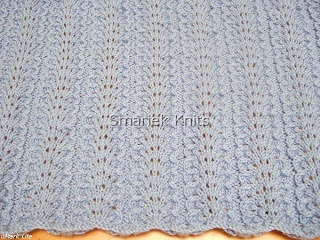 This is the same blanket I made before, in pink, back in June 2005. I must admit that it was easier to knit the second time around. 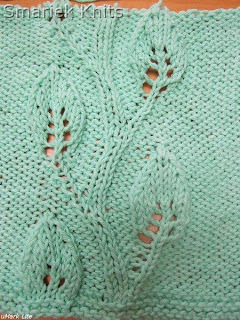 I remember how difficult it was to figure out the lace row instructions, and I only managed it with the help of the helpful ladies at the Knitting About.Com forums. I thought I would never finish the blanket. When I got to the end of the 2nd ball of yarn, I had to make a decision. Is the blanket large enough? Did I want to go find another ball of this same yarn? Or did I just want to bind off and be done with it. After working on this for over 2 years, the latter won without a contest. I bound off and pulled out the lifelines. I need to smooth out the blanket because it's a bit bunched up funny where the lifelines had been in place for way longer than they should have been. The blanket is 44 inches x 24 inches, and almost covers the surface of our coffee table. It's not a very proportional rectangle, but I think it'll be ok. In the photo above, you can see how much yarn there was left over (upper left). All I need to do is weave in 4 ends.